As one of the major persistent global issues, poverty is a common challenge for humanity. China, once home to the world’s largest poverty-stricken population, was one of the first countries in the world to introduce state assistance measures. As one of the major persistent global issues, poverty is a common challenge for humanity. China, once home to the world’s largest poverty-stricken population, was one of the first countries in the world to introduce state assistance measures. For thousands of years, it has been an intrinsic pursuit of Chinese culture to help those in distress and aid those in danger and improve people’s livelihood. From those ideas such as benevolence, being people-oriented, universal love, and great harmony advocated by ancient Chinese thinkers and philosophers, to China’s modern efforts to eliminate poverty led by the Communist Party of China (CPC), the country has been tireless in its pursuit of poverty elimination. Since its founding in 1921, the CPC has sought to improve people’s wellbeing and achieve national rejuvenation. After the founding of the People’s Republic of China, as the ruling party, the CPC has taken serving the people wholeheartedly as its fundamental governing principle. The socialist system has undoubtedly laid a solid foundation for the country to eliminate poverty. After its reform and opening-up kicked off, China started massive, state-organized, and well planned poverty relief and development campaigns with a succession of national plans introduced. Since the convening of the 18th CPC National Congress in November 2012, the Central Committee of the Party with Xi Jinping at the core has incorporated poverty alleviation and development into the country’s five-sphere integrated plan (to promote coordinated economic, political, cultural, social, and ecological advancement) and four-pronged comprehensive strategy (to make comprehensive moves to finish building a moderately prosperous society in all respects, deepen reform, advance law-based governance, and strengthen Party self-governance). With poverty eradication as the symbol and fundamental task for China to build a moderately prosperous society, China has started its all-out fight against poverty. Thanks to the concerted efforts of the whole country, decisive progress has been made. The most impressive poverty reduction achievement in the world has been attained. As of the end of 2017, China’s rural population in poverty dropped to 30.46 million from 98.99 million in 2012 with an impressive reduction rate of 70 percent; and the poverty headcount ratio has decreased from 10.2 percent to 3.1 percent. With a yearly average of 13.7 million people lifted out of poverty, twice the number from the period of 1994-2010, the yearly average income of rural people in those poverty-stricken regions has seen an actual growth of 10.7 percent. From 2013 to 2017, rural residents’ per capita disposable income in poverty- stricken regions gained an average yearly growth of 12.4 percent; with adjustments for inflation, its actual growth stood at 10.4 percent, 2.5 percentage points higher than the national average rate for all rural areas. The gap between poor rural areas and the average national rural level has been further narrowed with rural residents’ per capita disposable income in poor areas reaching 69.8 percent of the national rural level in 2017, an increase of 7.7 percentage points over 2012. In those poor rural areas, 57.1 percent of farmers have moved into properly constructed houses or apartments, nearly all villages have access to electricity and 98.2 percent of them have their telephones connected. China has seen its number of poor counties fall for the first time. Taking the year 2016 for example, poverty was eliminated in 28 poor counties. The development in poor areas has been quickened. Industries have blossomed in those areas such as tourism, manufacturing, and e-commerce. Poverty alleviation measures are being implemented from a sustainable perspective as well to ensure protection on an ecological and environmental basis. These efforts have led to poverty alleviation and ecologically sustainable economic growth. In addition to that, there has been a great deal of investment in the development and upgrading of infrastructure in poverty-stricken areas, allowing the provision of better public services and well developed facilities for impoverished residents. In tandem with the government’s efforts, the desire and motivation of those suffering from poverty have also been spurred. Their inner impetus serves as the foundation for the establishment of a stable long-term poverty alleviation mechanism, and is also the key for poverty elimination. The process of injecting the impetus internally within the suffering populations to shake off the scourge of poverty is the common conundrum faced by the international community as a whole in global poverty alleviation efforts. The core of Xi Jinping’s thought on poverty alleviation is to combine poverty relief with measures to help poor people master skills in specific industries and boost their confidence in fighting poverty. Through guidance, policy incentives, and demonstrative projects, poverty-stricken populations will realize that they are responsible shareholders, and their sense of participation and fulfillment will be enhanced, which helps alter outdated concepts. A large group of official and talents have been cultivated. It has been recognized as one of the best ways to cultivate and temper officials to send them to the poverty-stricken regions to fight poverty together with local people. How to implement a range of poverty alleviation policies and measures is actually a good test of them. Those capable officials who have been sent to the poor areas by the government would grow into the country’s backbone for governance, with a deep emotional bond with rural areas, possessing a deep knowledge of the countryside, and knowing well farmers and the challenges faced by people there. A favorable social environment has been created. Practice has proven that the national campaign to fight poverty is instrumental in nurturing a harmonious environment for development, sound social morals, and cultivating core socialist values. Meanwhile, by supporting the western regions’ development, the eastern areas, which have taken a lead in China’s reform and opening-up, have also expanded their development space, demonstrating China’s socialist value orientation to achieve common prosperity. Central state organs have also formed pairs with poor counties to instill those counties with new concepts, ideas, technologies, and expose them to new markets. The pairing method has provided an important channel for the central departments and enterprises to learn about rural areas and draw close their relationships, and also provided a good platform to cultivate officials. With wide participation of organizations and enterprises of different sectors and individuals in the fight against poverty, social harmony has been further enhanced with people across the society being mobilized to help those in poverty. China’s experience in poverty alleviation, in particular its targeted poverty alleviation practices and the experience gleaned from them, has proven invaluable to the international community. To cope with the tough and complex task facing most developing countries, China has implemented comprehensive poverty alleviation policies. The Chinese government has played a leading role in the country’s poverty reduction efforts, which has also proven effective in reversing the global weakening momentum in poverty alleviation. China’s poverty assessment mechanism for identification and targeted alleviation strategy has been developed from successful trials implemented on a large scale and combines a top-down responsibility division system and a democratic assessment mechanism from the bottom up. In his congratulatory letter to the 2017 Global Poverty Reduction and Development Forum, UN Secretary-General António Guterres said, “Targeted poverty reduction strategies are the only way to reach those farthest behind and achieve the ambitious targets set out in the 2030 Agenda for Sustainable Development.” Ana Paula de la O Campos, advisor on rural poverty reduction with the Food and Agriculture Organization of the United Nations, pointed out in a recent interview with Chinese reporters that China’s significant achievements in poverty reduction could be ascribed to the fact that its government has given high priority to poverty alleviation with clearly set goals, and China has set a great example for other developing countries in poverty reduction. Famous French economist Michel Aglietta thought that China’s successful practices in poverty alleviation are very valuable and should be promoted worldwide. 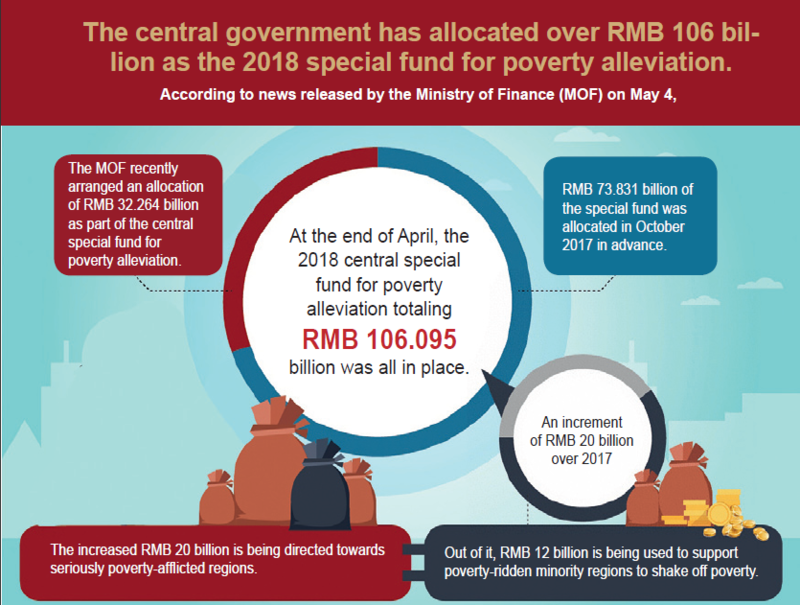 All these indicate that the Xi Jinping-proposed targeted poverty alleviation strategy has been held in high regard by the international community and been taken as an effective way to address the global poverty challenge. China’s fight against poverty has not only boosted the country’s confidence in the path, theory, system, and culture of socialism with Chinese characteristics, but also fueled global progress in this field. In the following three years, China will continue its targeted poverty alleviation strategy and further its efforts to fight poverty, giving priority to spurring poverty afflicted people’s motivation to shake off poverty, and eventually eliminate poverty in the country.